To the 'dream view' belongs the apartment Casa Bellavista in an outstanding position (750 m above sea level) with a magnificent panoramic lake view on Monte Isola and the two small islands Loreto and S. Paolo. Even the drive to the holiday residence Borgo Degli Artisti is a visual experience. The apartment has its own parking space. From the large terrace opens the view of a magnificent landscape with its thousand colors. Sunset, twilight, with a glass of red wine from the Franciacorta, contemplative idyll with easy accessibility: By plane to Bergamo or Milan, then by rental car in less than an hour to the holiday residence. Or by car, half an hour to the A4 motorway. Brescia and Bergamo in the immediate vicinity, fast connection in 1-2 hours by car to the other cities of northern Italy: Milan, Verona, Venice, Turin, Genoa. Lake Iseo, Lake Iseo, also Lake Sebino: the lake is today an important natural oasis for the numerous neighboring villages of the provinces of Brescia and Bergamo. It is a natural resource to protect, also in terms of its importance for leisure and tourism. It is the lake of a thousand faces, simple and picturesque, gentle and untamed. Its romantic atmosphere owes its popularity to poets and painters. Surrounded by a magnificent mountain range and fed by the river Oglio, it is 185 m above sea level, is up to 251m deep, averages 2.5 km wide and measures around 60 km in circumference. It is also called Sebino (the "Sebinus lacus" of the Romans). Lake Iseo surprises with a variety of natural beauties and appears constantly new in the existing light and color plays. The climate is mild and extremely pleasant in summer thanks to a persistently light wind; There are also many sunny days in autumn. Sports and nature: The region around Lake Iseo offers sports enthusiasts a variety of opportunities to do sports all year round in a nature that is still untouched by mass tourism and ecologically intact. Fans of Lake Iseo are designated water sports fans during the spring and summer months. In addition to canoeing and water skiing, sailors will find excellent conditions: Last but not least, Lake Iseo has five sailing clubs. But the motorboat sport was abandoned in 1976 for ecological reasons. A new sport is becoming more and more popular: wakeboarding, a school can be found in Paratico. The area around Lake Iseo is very interesting for climbers. Climbing gardens are directly supplied by nature in various areas, which have given rise to popular climbing schools due to the particular geological formation in Boario, Cividate Camuno, Ossimo and Rogno. Paragliding or ultralight sailing is possible at the Edolo (sports field) or Restone (1400 m) airfield. Hiking and Climbing: A historic walking route is the Antica Strada Valeriana, built by the Romans. It has been partially restored in recent years and 2001 made accessible to the general public again. Today's high-altitude trail runs on the eastern side of Lake Iseo from Pilzone in the south over the Pass Croce di Zone to Pisogne in the north and extends for a total of 24 km. The narrow, partly cobblestone path runs through picturesque vineyards, olive groves and fields as well as ancient neighborhoods, lined with chestnut, walnut and fig trees, with beautiful views of the lake. Monte Isola: island tour (easy, also suitable for bicycles) or to the Madonna della Ceriola (600 m) up (1.5 h). Waterfall path in Franciacorta (Sentiero delle cascate): two routes (1h 20 min - 2 h 10 min). Pyramids in zone (Piramidi di Zone): hike with viewpoints to the pyramids 1 h (from parking Cislano). Modern bathroom with free walk-in shower. In the bathroom, the washing machine is housed. Exterior window. The bathroom is tiled as the rest of the living area. In the bedroom, wood floors have been laid. Casa Bella Vista is characterized by the large windows, large balcony windows in both the living area and the bedroom. So the lake with its varied colors is always present. Due to the large kitchen windows overlooking the spacious terrace that surrounds the house on three sides. From the kitchen window you can also view the pool from which one has a magnificent panoramic view of the lake, Monte Isola, the foothills of the Valcamonica and nearly 2000 m-high Monte Guglielmo. Above the residence Borgo Degli Artisti is reached via a footpath to the Belvedere lookout point from where the sea can be seen in its entire extent. Also, the above village Parzanica can be reached within a few minutes, there you will find a small supermarket, bakery, restaurant and of course a bar. The apartment is part of the small residence Borgo Degli Artisti in the district of Belvedere Parzanica. 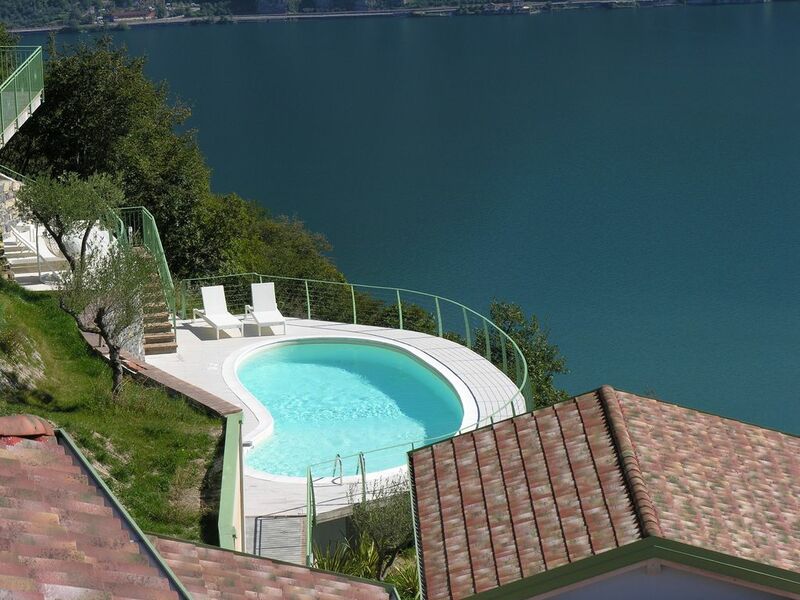 From here you can enjoy a magnificent view of Lake Iseo, Monte Isola and the surrounding mountains. The wild-romantic Lake Iseo, 185 meters above sea level, 251m deep, is the smallest of the four major Italian lakes, but also blessed with many natural beauties: Monte Isola, largest lake island in Europe, extends more than 400 m from the water. The impressive earth pyramids in Cislano east of Marone, which have arisen from remains of an old moraine. Torbiere del Sebino: nature reserve with smaller ponds and lakes. Prehistoric rock art in Capo di Ponte. The mild climate on Lake Iseo, very pleasant in summer by a persistent breeze, ideal for swimming, sailing, hiking, mountain biking, climbing, golfing or just to idleness, the dolce far niente. Golf: Franciacorta Golf Club, in the heart of the famous wine region of Franciacorta, near Lake Iseo to about 185 meters above sea level, has a 3 x 9 hole championship-Cours. The system is suitable for all skill levels. Especially difficult are the two island greens. Good players rave about the challenging and varied golf course and the highly manicured grounds. Guests, including children are welcome. The golf club is located approximately 7 km from Lake Iseo Located in Nigoline di Franciacorta. Ski: Very good winter sports facilities there are in Monte Campione, one of the youngest and most modern ski resort locations, within easy reach in about 35km. The ski area has 30 km of slopes on a height of 1200 to 2000 m, 20 easy and intermediate slopes, 2 ski tows and 9 chairlifts. Located fifteen minutes from Monte Campione you get to the places Boario Terme and Angolo Terme, where spring mineral springs. A rewarding trip to the mental and physical regeneration. In both places you can also perform special drinking cures.